After Meet&Greet and the Business session, the program is “Morse Code and YL activities”. Jerry Turner AG5OK, Kim Elmore N5OP, and Bill Roberson N5AQ, will talk about a program to help you learn morse code. You’ll learn how to learn, and how to use morse code on the air, and how you’ll get help to make this happen. And, our own Michelle Carey W5MQC, who recently became the Young Ladies Radio League (YLRL) District 5 Representative, will update us on upcoming YL activities. She’ll talk about opportunites available in the club, the state, and the district, including her new role with the YLRL. Congrats to Michelle on her appointment to that role! SCARS meetings are held on the second Saturday of the month at 9:00 am. All of the location and time details are available on the Meetings/Nets page of this website. This is a Wall Street Journal article from a couple of years ago highlighting Amateur activities by some notable Veterans. I missed this because of where it was – The Wall Street Journal. Great read. Thank a Veteran today, and to all Vets reading this today, my hat is off, my hand is out to shake YOUR hand and say “Thank You For Your Service”. 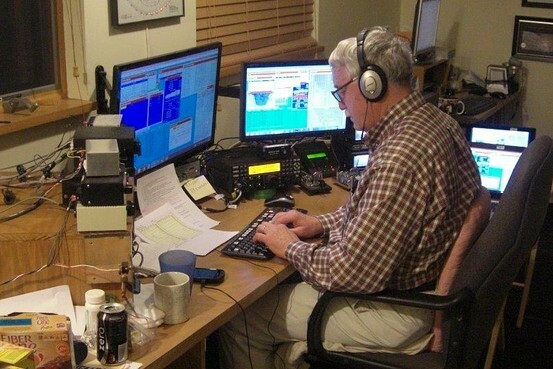 Curtis, K5CLM, edits a Blog titled “Everything Hamradio”. This week Curtis uses the subject of Morse Code to highlight SCARS (*I* think because the bump SCARS got when N5HZR started promoting code practice). Go give the story a read (hint: The SCARS Highlight is at the bottom of the post. You can also listen to this as a Podcast as well). This week we officially announce the worst kept secret in amateur radio, the SCARS LearnMorse web section located at:http://w5nor.org/morse During our most recent Technician / General class over 60% of the attendees reported that the wanted to learn Morse Code. We reminded them that they didn’t have to learn it for the test, but there was a good number of people that were interested. So, after some thinking, and discussion, the Instructor team figured out that learning Morse Code was really an individual task, and that bringing a group together wouldn’t really be an efficient way to train. So, we sat down and developed a the LearnMorse project on the SCARS webpage. This coming Saturday we’ll have a presentation to talk about the history of Morse Code, the Mystery of Morse Code, and the future of Morse Code. The online section teaches Morse Code on a method called the Koch method. The idea of this process is that you start learning the tones as sounds, and you really don’t think about the dits and the dahs. Sort of like the idea that when you hear the word DOG, you think of a four legged, mostly furry animal. You don’t think letter D, letter O, and letter G, oh, that must be a furry animal. So, following that logic, the tones you receive must be fast enough that you really can’t decode them in your head as dits and dahs. William G. Pierpont N0HFF, wrote the book “The Art and Sound of Radio Telegraphy” and he’s got more research on Morse Code that you ever thought could exist. Pierpont says that the best speed to start is between 15 and 25 words per minute. We chose 20, as it splits the difference, and it provides the user with plenty of speed when they’re done with the course. The other part of the Koch method is that you didn’t learn your whole vocabulary at once, so you should start by learning two letters during the first lesson, and then keep adding letters as you move forward. So, the first lesson is the letters K and M, and you are supposed to listen to them until you can get them correct about 90% of the time. You’re working on hearing the sounds, and keeping them straight, and you’re not really concerned about writing them down. Just listen, and think of the letters. For each lesson there are 6 recordings. The first will tell you the two new characters, and then the remaining five recordings are 5 minutes each, that give you random characters from your current vocabulary. Remember, you don’t have to get them 100%, you just have to get the idea of what the sounds relate to. You keep practicing all of the characters every day. For the next 19 lessons, two more characters are added to your vocabulary, and you keep listening as you go. Remember that this is supposed to be an enjoyable experience. If you can only listen to one message and then you need to break, that’s fine. If you want to binge on all five messages, that’s fine too. If you’ve got a problem with some characters, you can even listed to the lessons more than once. After the first 20 lessons, you will switch to every other day practice, and you will be presented with 20 lessons (100 recordings) of actual QSO’s, famous quotes, text from the NASA space program, and random words. As you listen to these, you’ll probably start to hear groups of letters, for example, you might hear T-H-E as the word “the”. At any time throughout the process, you can stop, and restart at a different section if you’d like to go back and study something again, or jump ahead if you’re feeling confident. To test the waters with this program, I posted a message announcing this program on QRZ.com, and we quickly got a lot of responses. Over 5,000 people read the QRZ.com article, and we’ve had more than 15,000 page views, peaking at about 3,000 per day. On those days we were serving over 13 GB of audio files to 112 different countries across the globe. We’ve had over 400 people signed up for the messaging service, and to date we’ve delivered over 9,000 emails to remind people to practice their code. So, if you’re one of those folks that have always wanted to give Morse Code a try, visit http://w5nor.org/morse and sign up for a free daily, or every other daily, email that will guide you through the task of learning Morse Code. If you already know Morse code, sign up to the practice sessions, and you’ll speed up your comprehension. There’s also Facebook group shown there that will connect you to 100 people interested in Learning Morse Code!!! “Anderson PowerPoles and Antenna Polarization“.